See each ad in a graphic version (as designed for publication), in text format, or download as a PDF. The SBT refused to publish: “You Must Be A Roman Catholic Or Go To Hell” (after billing and collecting for it). In the right hand menu, the four ad titles in red were summarily cancelled after being approved. Click to view or download the full booklet. It would have been 14 weeks but the paper refused to run “You Must Be A Roman Catholic Or Go To Hell,” due to fear of losing subscribers. The theme in all these is that the Christian religion is entirely man-made. And it is that fact which explains why it is both immoral and evil. Its insistence that you must love Jesus, or spend eternity suffering in a “lake of fire” cannot be excelled in malignant, hateful spite. Each stands alone. They each stand alone, make, and justify, one or more points. They were written by me except for 3, which I extracted from the works of the great Robert G. ­Ingersoll (1833-1899). I am 89 years old, have a law degree, and 45 years experience running two of the largest direct marketing firms in the country with dozens of nationally known clients. Our job for them was to induce members of the general public to donate, subscribe, become a member, sign a petition, redeem a coupon, buy a new car, take a foreign trip, and so on. Results were always measured to the penny. I have been thinking about Christianity for a long time, and since retirement 26 years ago have done a great deal of reading and learning. I saw countless more reasons why I was right as a boy to be skeptical about how a good God could ever start this misery-packed life in the first place. That, coupled with my experience in using print media to persuade people in the mass audience, convinced me that the atheist community is missing a huge opportunity by failing to reach millions of intelligent people, who know nothing of our wonderful books, by real scholars, philosophers and scientists —and who will not learn of them unless helped. Millions is not an exaggeration, considering the size of the ­potential. Further, there are those on the weakest end of the “nones” curve (those who identify themselves as having no religion) who will benefit greatly by the simple and devastating arguments presented in these ads. Not to mention, stalwarts who will rejoice in seeing the outreach. Intellectual reasons are not enough for most people, whose emotional nature is dominant, to turn aside their early enculturation. The substance of these ads presents “heart” reasons, all based on Christian fundamentals which cannot be denied. The heart reasons will resonate, especially with the young who are already coming our way at an increasing rate. See the very latest Pew Research in the ad, “Christianity Needs Salvation, Urgently!”. They will appeal to others already among the weakest on the faith spectrum. These include, LGBT, unmarried couples living together, divorcees, and others, resentful and unbelieving when told they are living in sin—just for being themselves. The weakest on the doubting side will find concise and ­decisive arguments, easily learned and remembered, and grounded on a moral standard far above the one the Christian theologians contrived over centuries. The words and style used are on based on real-world experience and are designed to attract attention, generate enough interest to be read, and provide content that vindicates the teaser headlines. Without a response mechanism, we are deprived of exact feedback to sharpen ads with scientific testing—the only way to discover what is best. So this is pure advertising and we must be content to know—as we surely do—advertising works! Do not be put off by the length of some ads, I have seen 6-pages of simulated typewritten text generate 30% more sales than a beautiful 4-color brochure in selling tickets for a tour in Ireland. A thirty percent improvement is unusual, but long copy has been proved in many other applications. If people are interested they will read long copy, in fact, they want it—especially if presented in short sentences and in graphically interesting ways. 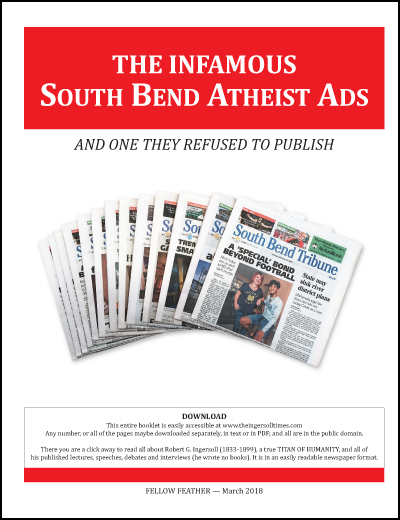 Also included are a few ads published in Free Inquiry magazine in an effort to demonstrate to my fellow atheists the kinds of copy and arguments to reach those we are not reaching now. I fervently hope that atheists and our organizations will see the merit in undertaking a real educational effort to reach the millions described, and that the simplicity of these arguments will not be a barrier to their use. O Beautiful Star of Bethlehem? They Would Not Even Look in the Telescope!